David Robinson was not born in Scotland, and yet cannot do without a sprinkling of some Scots words in his vocabulary now. Here he explores his own curiosity on a language that fascinates and confuses him in equal measure. And publishers: there’s a call to arms at the end, which BooksfromScotland think is a very grand idea indeed. I have quite a few books on my shelves by friends, but only one that is written by one friend, translated by another and illustrated by a third. It’s written in a language that I don’t speak, yet which I partly understand even though I was never taught it. 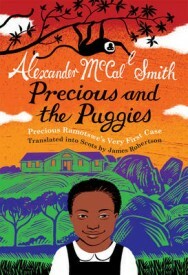 Precious and the Puggies (Itchy Coo, 2010) by Alexander McCall Smith (translated by James Robertson and illustrated by Iain McIntosh) is that book and it is, of course, in Scots. And of all the subjects anyone born, like me, south of the Tweed should be wary of writing about, Scots is fairly near the top of the list. So although – see below – I’ve got something to say about it, I’m going to tiptoe away from that well-planted minefield of the extent to which it should be taught, published or broadcast. That’s up to Scots to work out. Not people like me who weren’t born here. That said, I’m broadly sympathetic. Who wouldn’t be? When, in McCall Smith’s story, the young Precious Ramotswe, in the middle of solving her very first case, walks home from school down a path that winds round boulders, Robertson’s Scots seems to emphasise its tortuousness. “It was a narra, joukin path – here and yon, muckle boolders had whummled doon the brae thoosans o years syne and the path had tae jink aroond them. In atween the boolders, trees had raxed up, their roots snoovin their wey through the gaps in the stane.” Whummled, joukin: you don’t have to be a Scots language obsessive to see its beauty, to see it lifting a child’s imagination, making it grow and twist around its subject like those raxin, snoovin tree roots. Breathes there a teacher with her soul so dead as to say no, we won’t have that kind of language here, in my classroom, thank you very much? In its own country? Of course not. And the child whose brain takes in both rolling stones and whummlin stanes is, I don’t doubt, going on to have a greater number of thoughts zapping across his or her synapses. Those different thoughts will make different connections, no doubt giving a greater fluency in other languages too. Scots might have some problems, but equally clearly it is a language with its own verve, power, past and presence. So yes: I get all of that. And yes, I can see how in the thirty-plus years I’ve lived in Scotland, some Scots words have started to invade my English. “Wee” is obviously so much more versatile than “small” and so has replaced it completely, just as “dreich” sounds even more perfectly miserable than “dreary”, so I’ve already made the switch. Gallus, shoogly, thrawn, thirled, scunner, besom, sleekit, sonsie, flyting have all staked an inviolable claim on my vocabulary, either because they’re clearly so much more expressive than their English equivalent or because there isn’t an equivalent in the first place. Even when both the English and Scots words have their own quiet beauty – beyond and outwith, for example – there’s a subtle difference in meaning. Before I came up here, I’d never used outwith. Now I’d never be without it. Against that, there are words that defeat me completely. Take “gantin for a gunk”. 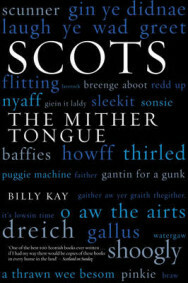 It’s on the cover of Billy Kay’s The Mither Tongue along with such obvious Scots words as “baffies” and “pinkie” so I thought it must be equally well-known. Not to me it isn’t. Google doesn’t help. Gantin: “Scottish word commonly used to describe one who smells, or a person who is ugly, also said to describe the genitalia of a female,” says urbandictionary.com. In Glasgow, it adds, the word means “to be in dire need of sexual satisfaction.” “Gunk”, according to the Dictionary of the Scots Language at dsl@ac.uk, means “a bitter disappointment” or “a dunce”. And yet, according to Kay, gantin for a gunk means nothing you could guess from any of that but “desperate for a shock”, which is the sort of phrase I can barely imagine using in the first place. You can’t, in other words, guess Scots. And right enough, whenever I try, I get things wrong. Bonnie broukit bairn means neglected, not – as I’d have guessed, broken. And Precious and the puggies was nothing to do with slot-machines or dogs or even “the hole in a game of marbles into which marbles are rolled” (the only meaning given in the Dictionary of the Scottish Language) but monkeys. Monkeys! Did you know that? I didn’t. Actually, I would have guessed that one easily enough from Iain McIntosh’s artwork for McCall Smith’s book, which handily has a monkey hanging upside down over the cover byline. But not every Scots word inside it is as obvious. Would I have guessed that jalouse meant guess? Maybe. But at least all of this makes me think. 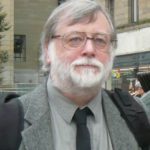 If I ruled the world and wanted to spread Scots, what would I do? How could I do it while minimising wrong guesswork? And where’s the gap in the market? Itchy Coo, it seems to me, do an excellent job in spreading Scots in our primary schools. But what is there for adults? Nothing. Naething. We’re not all born in Scotland. There are 470,009 Scots who come, like me, from south of the border. Maybe, also like me, they’re a little bit lazy because they already speak what even Billy Kay admits is “the most useful language in the world”. Or maybe these adults come from further afield, from Iraq or Syria, say, and they already have English but yearn to put down deep linguistic roots here in Scotland. When they look up phrases like gantin for a gunk, they too might get meanings hopelessly wrong, as I did. When they use English to guess Scots, they might go similarly astray. So here’s a thought. Someone should find and translate from English into Scots a book that is a) aimed at adults not children, b) massively popular (ideally most people should have read it already in English or have their own copy) c) not too long and d) out of UK copyright. I’m no expert, but I reckon all of Orwell should be coming out of copyright in 2020, so there’s plenty of time to line up a publisher and get in that Open Project funding application in to Creative Scotland for a Scots translation of Animal Farm. If they insist it has to be by a Scottish writer, well, there’s no problem with The 39 Steps (or any of Buchan’s books come to that) but we’ll have to wait until 2035 for Ian Fleming and 2045 for a square go at a Scots PG Wodehouse. Which is, I think you’ll agree, a bit of a shame, eh what?